Last night the world was a stage for a bunch of llamas running wild in Arizona. Yes, you read that correctly. Llamas. The Bonnie and Clyde of llamas had everyone’s attention as the duo was chased down the streets of Sun City. The llama did not respond. As a matter of fact, he let Lemon do all the talking. 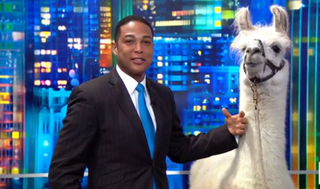 Don Lemon, llama whisperer.